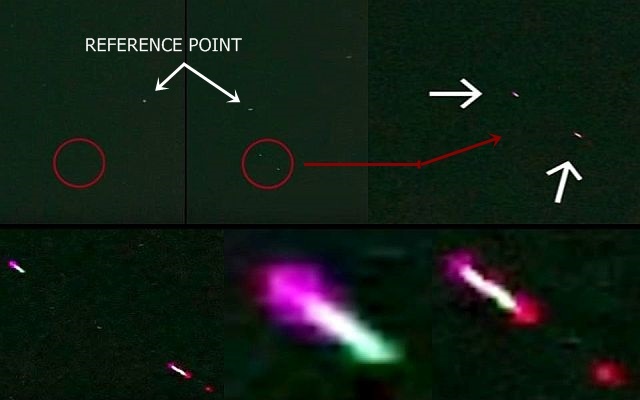 UFOvni2012 who was scanning the skies with his telescope captured something unusual. A bright and colorful object that suddenly appears and disappears in a split second and after having enlarged the object it looks like it is some kind of transmitter which emits a red pulse. It is suggested that the scalar template is changing the time density the “signal” that causes conflict on earth is being interceded, the earth grid must change to induct a different code. They call this existing grid a “Net” that inducts the “alien signal” from the modified Berkland currents that transfers interdimensional gluon plasma in a cyclic form that repeats history at a causal level of human society, human consciousness and perception is interwoven into the etheric currents that are carried on the coarser plasma and electromagnetic Tell-uric currents. Bright object that emits red pulse can be seen in the video from the 2.16 mark.